Long checkout lines are like poison to a retail business. In fact, when surveyed, consumers almost always make faster service their first request. So, how can you get employees to work more efficiently and move customers through lines faster? Easy. Install a new Transact2+ coin dispenser at each point of service, and you will save from 5 to 7 seconds on every transaction. To the person at the end of your express line or drive-thru, those saved seconds add up, getting them through checkout significantly faster. Giving them a better impression of your business. 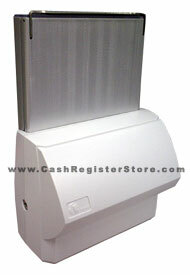 The Transact2+ coin dispenser has a small footprint and sleek design. It is built to withstand the punishment of high volume operations in the most demanding environments. The removable coin canister has substantial capacity. An RS232 port enables you to interface to various models of cash registers. The Transact2+ is readily adaptable to different currencies including the US Dollar, Canada, United Kingdom and EURO. Coin changer shown without coin tray. Coin tray IS included with unit.